Be a team leader on Oct. 5! 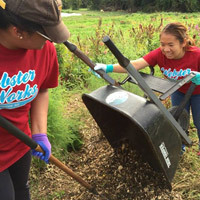 Webster Works Worldwide (WWW), Webster University's annual global community service day, is just around the corner on Wednesday, Oct. 5. Since the start of WWW in 1995, over 31,000 volunteers have given more than 134,000 hours of service. We hope you will join us in this very important Webster tradition again this year. For those at the Webster Groves campus, team leader registration is now open, creating outstanding opportunities to hone leadership skills, interact with colleagues, classmates and staff, and make a difference in this important annual event. Note: For campus locations outside of St. Louis, contact your local directors and coordinators for information on WWW projects in your area. Team Leaders are volunteers who serve as liaisons between individual volunteers and the agency in need. The Team Leader plays a critical role in communicating the details of the project and coordinating volunteers. What are the responsibilities of a Team Leader? Responsibilities of the Team Leader include verifying the details with the agency (time, location, number of volunteers needed, expectations), contacting volunteers on their team to make sure they know all of the details, arranging for carpooling for volunteers if needed, making sure volunteers sign the roster and encouraging them to complete evaluations. Following the event, Team Leaders will report the participation of their team. In St. Louis, a special Webster Works Worldwide opening event is planned for 8 a.m. in Grant Gym on Wednesday, Oct. 5. Mark you calendar for "A Send Off to Fuel your Mind, Body and Spirit" prior to the day's activities. We will hear some inspirational words, enjoy breakfast together and distribute WWW T-shirts. The 2016 WWW projects have been added to the database. Team Leader registration (only!) is now open. See the bottom of this email for basic information about serving as a WWW Team Leader. Please follow the link below to look at the projects offered this year. Once you are registered, you will show up as the Team Leader on the project page. You will receive additional information via email. If you would also like to reserve the project for your group you may do so here during your Team Leader registration. After selecting the "Reserve this project" box, you will be asked to enter your group's name. Please keep in mind the number of volunteers requested for each project. The project you choose must be compatible with the number of volunteers in your group. Volunteers can sign up online starting on Aug. 31. For more information about the event go to the Webster Works Worldwide website.